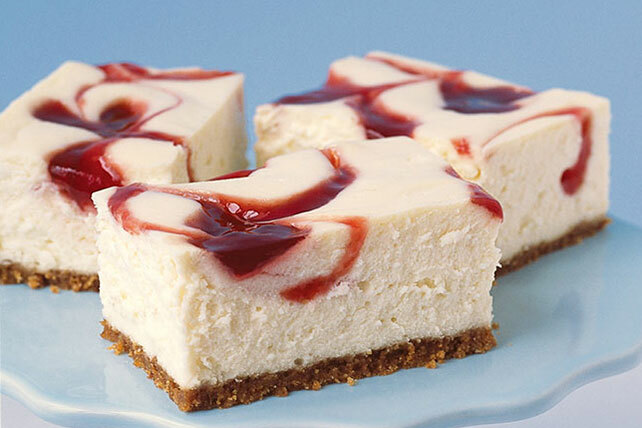 Enjoy a creamy strawberry-swirl cheesecake with jam and a crunchy graham cracker crust. Try our PHILADELPHIA New York-Style Strawberry-Swirl Cheesecake. Line 13x9-inch pan with Reynolds Wrap® Aluminum Foil, with ends of foil extending over sides. Combine graham crumbs, 3 Tbsp. sugar and butter; press onto bottom of prepared pan. Bake 10 min. Beat cream cheese, 1 cup sugar, flour and vanilla with mixer until blended. Add sour cream; mix well. Add eggs, 1 at a time, mixing on low speed after each just until blended. Pour over crust. Gently drop small spoonfuls of jam over batter; swirl gently with knife. Bake 40 min. or until center is almost set. Cool completely. Refrigerate 4 hours. Use foil handles to lift cheesecake from pan before cutting to serve. Save 70 calories and 9g of total fat, including 5g of sat fat, per serving by preparing with PHILADELPHIA Neufchatel Cheese, and BREAKSTONE'S Reduced Fat or KNUDSEN Light Sour Cream. Substitute 1 pkg. (16 oz.) frozen fruit, thawed, drained and puréed, for the 1/3 cup jam.